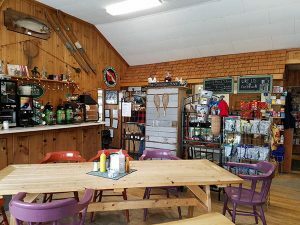 Have you tried the new Morgan Country Store? If not, add it to your list of summer destinations! Large portions, tasty food, and beautiful dining area. The old country store has a traditional rustic charm. 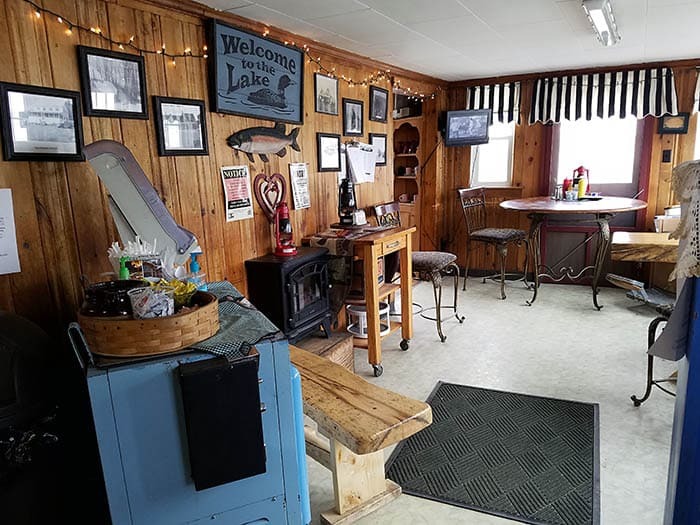 The back of the main area still houses a post office, and in the rear of the store are Vermont products, local items, beer, and a wonderful wine alcove. Though the main area still has a number of grocery staples, the Country Store has really been turned over to the deli. When you first walk in you are greeted by a little front room decorated with retro furniture, a few wood tables, and even an old Coca-Cola cooler. A TV in the corner of this room shows races, games, and (on the day I was there) old westerns. Guys coming in for lunch took seats in here and took advantage of the television. In the main room of the store are a few more large communal tables. All rustic wood, they give the space a very homey feel. Libby, the owner, told me that the picnic table and many of the benches were made by the North Country high school students. The walls are lined with antiques, rustic pieces, and old photos creating a lot of visual interest while remaining uncluttered. There is even a little borrowing library, a great addition to the rural area and a delight to visiting children. I found the dining space so charming that I happily wandered about before ordering. A look through the menu showed mostly sandwiches. Daily specials bring in more classic items like shepherd’s pie, pasta salads, chop suey, and other hearty dishes. But, Libby said she also uses the special list to try out fun recipes. 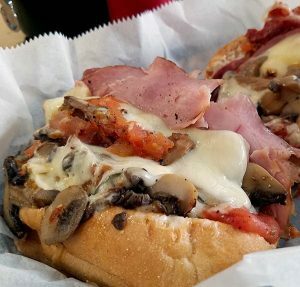 I decided to go with one of the menu items Libby said was a staple – the Italian Sandwich. I was not disappointed. The sandwich was huge. For under $8 I got a grinder that was larger (and more full) than its counterparts at other local restaurants. Special care was taken with the sandwich which added to the overall taste and appeal. First the sandwich was toasted with the cheese, two types of ham, salami, and capicola. All of the veggies (except the lettuce) were then toasted and added to the sandwich. I managed to make it through half while it was still warm – but that was it, I couldn’t fit anymore. It was fantastic! Homemade bread was the only thing that could have made this sandwich any better. 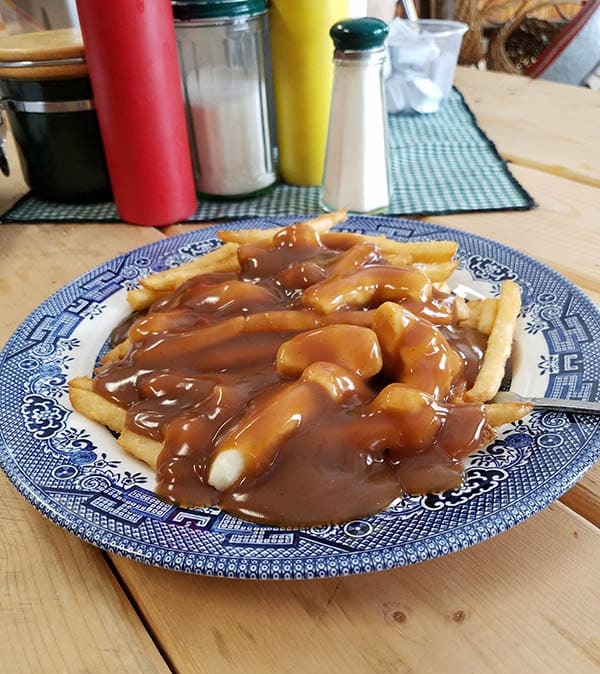 I also ordered a poutine (I have to try them whenever I go somewhere new). The cheese curd came from a local, Newport Center farm and was a more traditional, sour cheese curd. 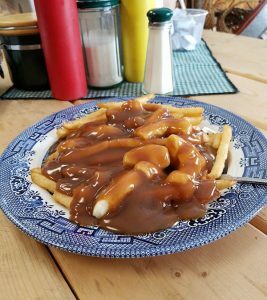 The gravy was a house made pork gravy, thick and salty – perfect for poutine. They carry a rotating arrangement of pastries so I had to try one, but as I was so full it went home with me for later. It was great with my morning coffee the next day. The filling was a jelly instead of fresh fruit, but the pastry was light and flaky. The Morgan Country Store has started to serve beer and wine as well, making for a great addition to a lunch or dinner. They have a pizza menu and you can order take out. Libby mentioned that she has plans for Friday and Saturday night dinners soon, where she will plan a few special entrees for a more restaurant like dinner. I am looking forward to taking a ride out to this Morgan, VT restaurant come summer. The area is beautiful and right on the lake. With their great food, a glass of wine, and maybe some outdoor seating it will be the perfect place to enjoy a Vermont summer day.